The balloon flight begins early in the morning, near dawn. The complete activity lasts about three hours which corresponds to one hour flight. 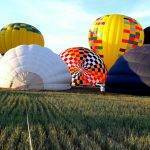 Flying aboard a balloon is extraordinarily safe. Siempre en las nubes also includes a celebration with champagne, a picnic after landing and delivery of flight certificates. All passengers receive a video of their adventure and photographic reportage of their experience. From € 145 per person. With the first light of dawn passengers arrive to the takeoff point. Both the pilot and the ground crew work conscientiously to install the balloon and receive the guests. They begin to fill a balloon with air in the rays of the rising sun. Passengers who wish may help installing the balloon. One can feel the atmosphere of an adventure. This show is just the beginning of an unforgettable experience. The first burner flashes are sufficient for the balloon, which lookes like a huge multicolored whale, to take off ready to fly. His huge envelope, which until this moment was just a large piece of cloth, is now superb like a giant upright in the countryside. The excited passengers get into the basket. Before takeoff the pilot explains about the safety instrucctions and answers the most commojn questions. Everything is ready for takeoff. Gently, almost magically, the balloon takes off and starts its air travel. You’ll have one hour to look at the world from a privileged balcony in the clouds. The pilot leads the balloon at different heights looking for the most favorable air currents so that the flight is varied and entertaining. The time really flies. It is common to see all kinds of wildlife during the ride. There are no abrupt or unpleasant movements. The basket is extremely stable and it seems that it’s the world that is moving under us showing its secret corners. The views and feelings are unforgettable. After a reminder of safety measures the pilot starts the landing, one of the most funny and exciting moments of a balloon ride. After landing passengers may, if they wish, cooperate in the collection of the balloon, a good way to make your experience even more intense. And right there, where the wind and destiny have brought us, we repeat the tradition that has been held since the first balloon flight, in this case a toast with Cava, a small lunch and a ceremony where the diplomas certifying your flight are delivered. Siempre en las nubes records an HD video of all flights and then sends it to the passengers. Price: from € 145 per person. 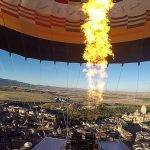 The balloon ride with Siempre en las nubes includes one hour balloon ride, a traditional champagne toast, a small lunch after the landing, your flight certificate, photo report, an HD of the flight and liability insurance for all passengers. See also private flight options and special flights. We recommend hiring accommodation after receiving our confirmation of flight. Our flight areas son Segovia, Salamanca, Valladolid, Toledo, Madrid, Aranjuez and Merida which offer a wide range of accommodation. 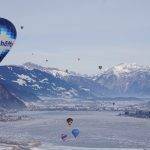 We recommend you to visit trivago to find the best choice and thus reserve the right accommodation for you and enjoy your experience balloon flight even more.